When I was in elementary school, Happy Days was my favorite prime-time show. 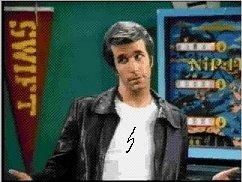 With its then-unusual teaming of "nerdy" characters like Ralph and Potsie with the "all-American" Richie and the almighty Fonz (as corny as his character may seem in retrospect, he was very edgy and cool at the time), the show in its early years offered plenty potential for brilliant comedic situations. When you tuned into the show, you expected to laugh, and to be entertained in a very lighthearted, easy manner. But there's one classic Christmas episode that stands out as one of the greatest Happy Days moments of all because it unexpectedly breaks from its established tonal pattern. The show begins with the Cunninghams celebrating Christmas Eve by decorating the tree in their living room. Mr. C grumbles that he just wants to have a quiet holiday at home with his family and no outsiders. But when the mechanical Santa on their front lawn goes on the fritz, Richie and his dad drive out to Fonz's garage, and see the "greaser" sitting alone in the dark, eating cold ravioli from a can. Contrasting with the show's dominant comedic tone and the Fonz's ultra-cool demeanor, this scene immediately establishes itself as a classic - touching, poignant, and real. So, what does this all have to do with "Lost"? In my last post, I discussed the importance of ambiguity in the series, and in art in general. If ambiguity is an element that appeals to us intellectually; a story's ability to shift quickly and abruptly between moods and tones is its emotional analogue. Happy Days pulled off a remarkable moment with "Guess Who's Coming to Christmas," but "Lost" regularly navigates similar emotional extremes with shocking abruptness. One of my personal favorite episodes is season 5's "Some Like it Hoth," which combines so many things I love: time travel, the 1970's, Star Wars. While driving around in the Dharma van, Hurley presses Miles about his relationship with his father; Miles insists that his dad was no good - he didn't care about him, and basically abandoned his family. Hurley, who is in the process of "pre-writing" "The Empire Strikes Back" (with a few improvements), lightens the mood by joking about how Miles should take advantage of time travel to "experience changing his own diaper." 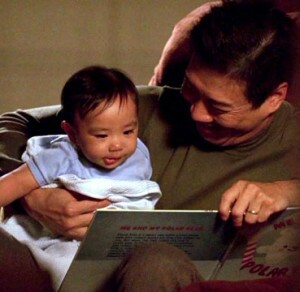 Suddenly, against this backdrop of light banter and camaraderie, the show drops one of its emotional bombs: while walking through Dharmaville to deliver a "package," Miles peers through the window of the house where he was born, and witnesses his father joyfully reading a storybook to his infant incarnation. I remember the first time I watched this episode: the moment was so touching, so unexpected, and contrasted so startlingly with the previously established mood, that I felt emotionally exposed. Damn "Lost," I thought - they got me again. And that wouldn't be the last time that the show would surprise me. The funeral of the actual John Locke was a heartbreaking moment - some even saw it as evidence that Locke's faith had amounted to nothing - and Ben's surprisingly honest confession added to the poignancy of the scene. I'll admit that I got choked up at this point - and seconds later laughing out loud at Lapidus' "This is the weirdest damn funeral I've ever been to" comment. And the moment after that, I paused the DVD to take a moment and appreciate just what an incredible show "Lost" is because of these emotional mousetraps it springs on the audience.